Sass is a seriously powerful web development tool. When it was first released, to install and use Sass required the command line and a Ruby framework. This was a big turn-off for many newcomers. But what if I told you, today, you can start using Sass within minutes? What if I told you that you could do it without ever launching your command line? You can. 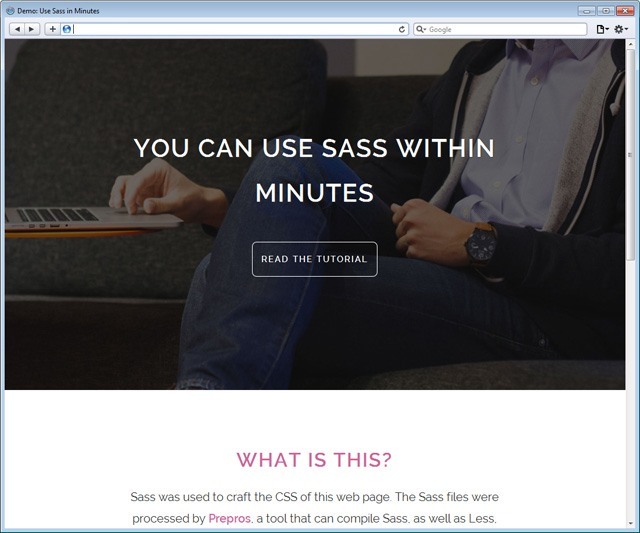 In this tutorial we’ll create a responsive web design using Sass, with the help of Prepros. First step: Download Prepros. Prepros is available on Windows, Mac OS and Linux. Prepros is free to use. But whenever you launch Prepros — and every now and then, when you’ve been using it for hours — it will remind you to buy a license. Personally, the notifications don’t bother me. 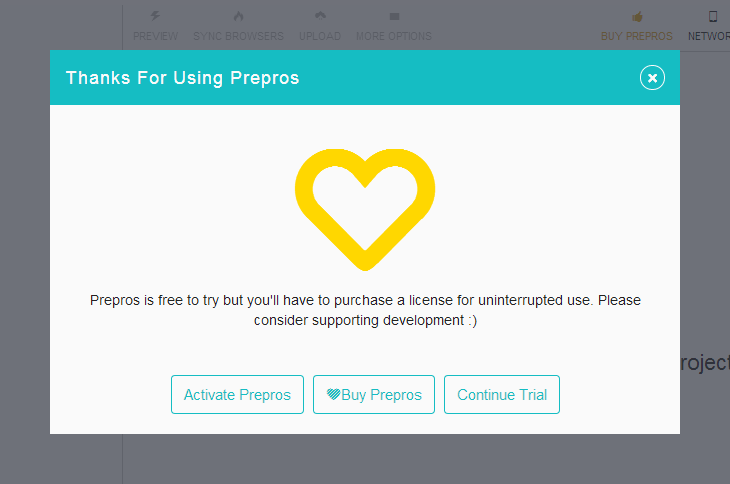 But if you derive a lot of value from Prepros, I encourage you to buy a license to support its developers. Sometimes Prepros will bug you to buy a license. 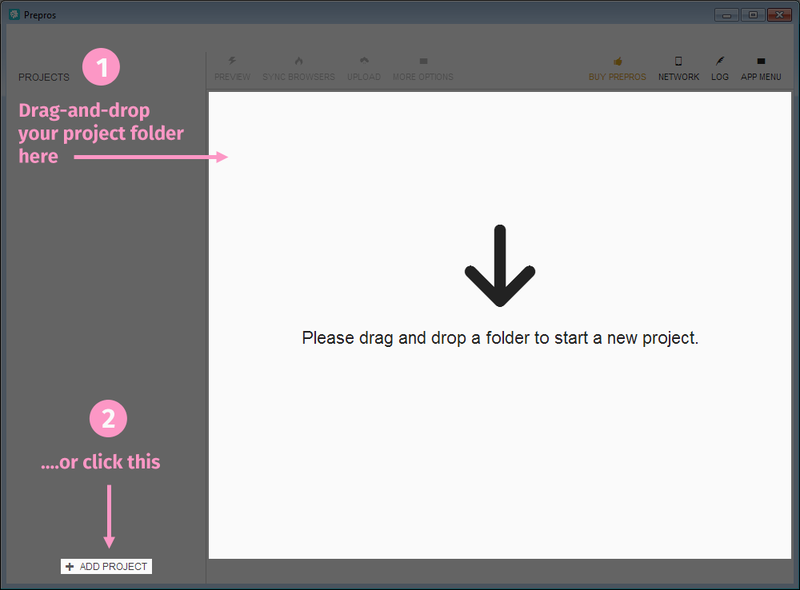 After adding a project, if you look inside your project folder, you’ll see Prepros created a new file. The new file is called prepros.cfg. If you’re curious: This file contains the configuration settings of your project. Let’s create the files for our Sass project. Use your favorite code editor for this. index.html — this is our web page. 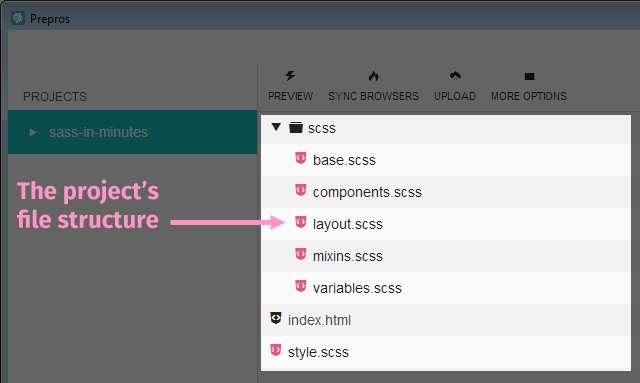 style.scss — This file just imports our Sass files. Prepros will automatically compile this into a CSS stylesheet named style.css. variables.scss — contains Sass variables that we’ll reuse throughout our project. mixins.scss — contains our Sass mixins. base.scss — the default style rules for HTML elements. layout.scss — style rules for the web page’s layout. components.scss — reusable class and ID selectors. The project files are structured in a modular way, even though we’re only building a simple landing page. This level of CSS modularization is most beneficial in complex, large-scale websites, though. After saving style.scss, a new file will be created. It will be called style.css — this is our project’s stylesheet. What you’ll notice later on is that whenever we update one of our Sass files, Prepros will also automatically update style.css. 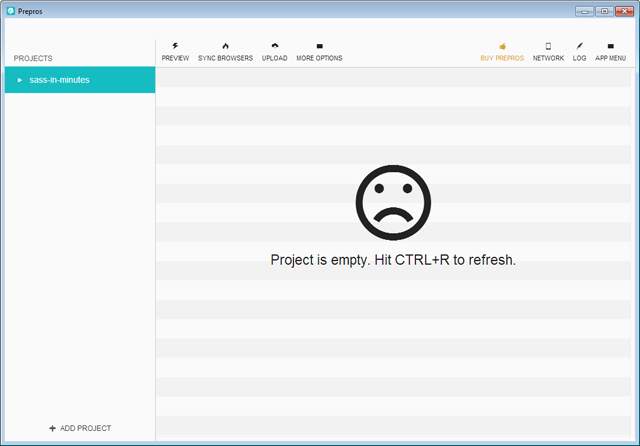 Right now, style.css is empty only because our Sass files are also empty. You’re now ready to use Sass! If all went well, the whole process would’ve taken you just a few minutes. As promised. To make sure everything’s working properly, why don’t we create a web design? Notice that we’re referencing style.css. We’re not referencing any of our Sass files in the markup. That’s because Prepros will automatically compile our Sass code into regular CSS and place it in style.css. Now let’s write some Sass. I’ll go through the code for each Sass stylesheet now. Sass variables are useful for CSS properties that you reuse throughout the project. Colors, the font stack, font sizes, and media query breakpoints are some typical variables we could define as Sass variables, because we end up using them over and over again. That way, when we need to change the values of these properties — say, if we wanted to change a color — we’ll only have to make the change in one place. I’ve declared some default styles for the HTML elements used in the web design. Our web page is laid out into four sections: .page-header, .description, .learn-more and .footer. The components.scss stylesheet contains reusable classes. Particularly, .call-to-action-button and .headline. There are three mixins in our Sass project. They help us set responsive full background images on a couple of the web page’s sections, uniformly set our font-size and line-height values and help us with property transition effects. All of that Sass code is automatically compiled into one big stylesheet called style.css. Let’s talk about a couple of useful Prepros project options. If you use a lot of new CSS features that still need vendor-prefixing, you’ll want to turn on automatic vendor prefixing. In the Prepros window, click on style.scss. A sidebar will show up. Check the AutoPrefix CSS option. Click the Process File button to update your style.css file. You can improve the download speed of your CSS files by minifying them. Minification removes non-essential characters such as spaces, tabs, comments, and so forth. 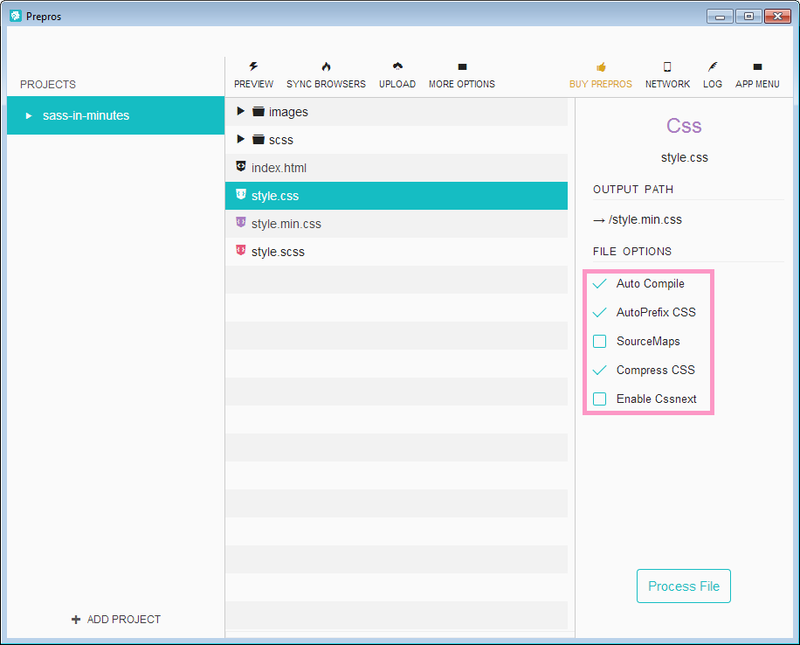 This will lower the file size of our style.css file. Click on style.css. The Prepros sidebar menu will appear. Under Output Path choose the name and location of your minified stylesheet. In this project, it’s called style.min.css. Enable the Compress CSS option. Just with this quick and easy change, we’re able to reduce the file size of our stylesheet by 21.4%. Learn Sass. If you’re new to Sass, you’ll have to spend time learning how to write CSS with it. I highly recommend the Sass Basics Course at Treehouse. It’s taught by Hampton Catlin, the creator of Sass. I’ve taken this course, and I’ve got nothing but great things to say about it. You can also check out the official Sass website if you prefer learning Sass “the hard way”. Explore Prepros settings. There are many options and features tucked away in Prepros. It’s worth the effort to explore and discover what Prepros has to offer. This tutorial barely scratches the surface of Prepros’s feature set.